In cleaning it up for release, I’ve noticed some performance regressions on IE and Edge due to cleaning out old code I thought was no longer needed. As it turns out, I had had some older code to stuff things into RGBA textures and then unpack them in a shader for IE 10 and the original release of IE 11, which did not support LUMINANCE or ALPHA texture uploads! 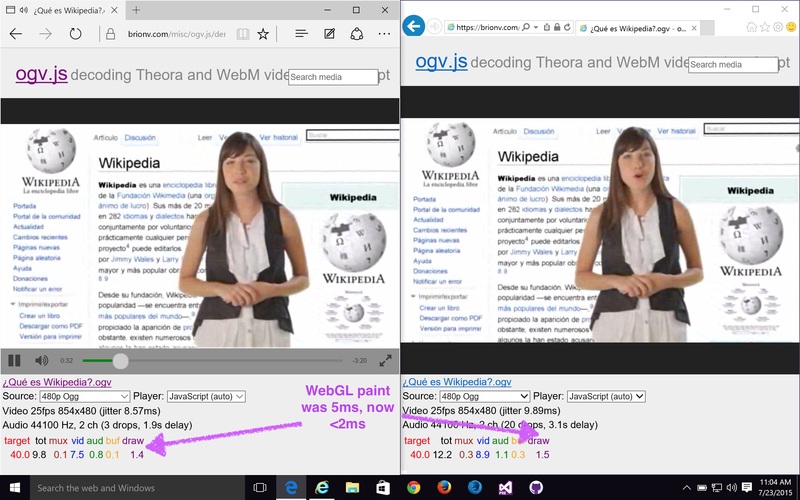 I had removed this code to simplify my WebGL code paths since LUMINANCE got added in IE 11 update 1, but hadn’t originally noticed the performance regression. Unfortunately this adds a user-agent sniff to my ogv.js code… I prefer to use the LUMINANCE textures directly on other browsers where they perform well, because the textures can be scaled more cleanly in the case of source files with non-square pixels.